Last year the kids were given the Predators and Producers board game and I was so impressed with it that I wanted to try another one. Oaka Books have three different Science Board games for Key Stage 2 and three different Science ones for Key Stage 3 and while they all look good (my aim is to eventually have all of them for revision purposes) I was very keen to try their geography game. Now the game is aimed at Key Stage 3 years and my kids are 10 and 8 and I must admit we have not spent a lot of time on countries and capital cities so we changed the game slightly and made it more about learning/ discovering places on the map than revision. Although after playing the game our way I really do think we will continue using it and it will evolve into a really good revision game. The game is divided into two separate versions – The UK and Europe and The Rest of the World. Inside the box you get a double-sided playing board and 2 different groups of cards depending on which version of the game you want to play (I really like that it is 2 games in 1). It is dice based – so you throw the dice and that determines how many blocks you can travel. The aim is to win/ own as many blocks on the map as you can (ie as many different countries as you can). You win a block/ a country by answering a question if you get the question correct you can place one of your markers on that block denoting that you now own it. If someone else lands on your country afterwards and wants to challenge you for that country then the challenger and the existing owner have to answer a Quick Fire Question, which is all about capital cities. Now if you are playing this game as intended ie as revision then the player answering the question should look away from the board but if you have younger kids you can alter that and allow them to find the answer on the board (this is what we did). We challenged the kids that if they thought they knew the answer they should try to answer without looking but if they did not know they could use the map to find the answer and that was okay – so for us it really was more about the kids discovering new places on the map and learning as opposed to revision. 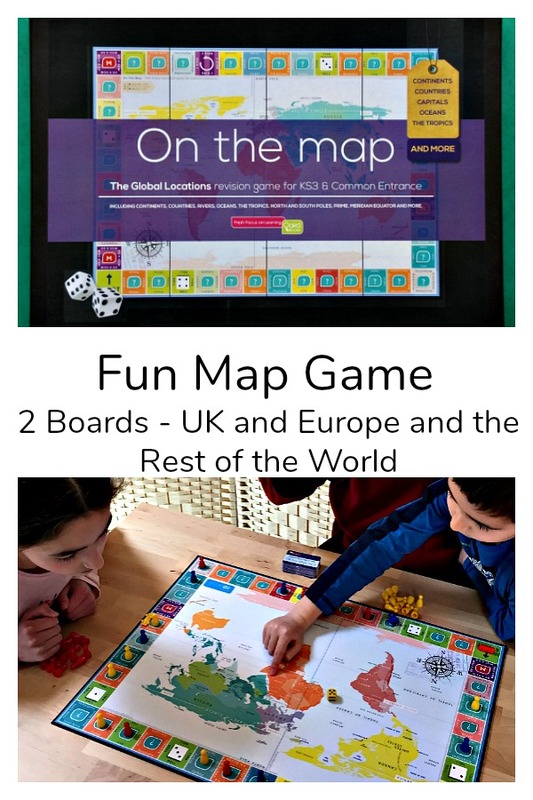 Both my husband and I felt that the game worked really well in this way – we used all the question cards and when necessary stopped to explain something but most of the time the kids really enjoyed searching for places that they have not heard of and were also very proud when they could answer a question without looking at the map. Also the UK and Europe version does include a number of UK-based questions which I really liked as it is something that we need to learn more about. We really like this game. And I do think it works just as well as a discover/ learn about the map game. My eight-year old who is not normally NOT a fan of board games actually asked if we could play it again this coming weekend so he could practice what he had already learnt and try to learn some new countries and cities. That right there makes it a WINNER for us. Admin Bit – We went sent a parcel of goodies from Oaka Books earlier in the year. It was up to us what we used / how we used it / when we used it and what we thought of it. This entry was posted in Homeschooling and tagged Board games, home ed, home education, homeschooling, kids geography, KS3, Oaka Books. Bookmark the permalink.